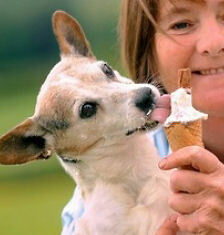 Everyone loves ice cream - even cats and dogs. In fact, it's not just fun for them to have a taste occasionally but it can be very therapeutic. For those of you who haven't been following this blog for very long, I featured a heartwarming story 4 years ago about a Jack Russell called Woodso (pictured left) whose life was saved by eating ice cream. Sounds crazy perhaps but true! Read Woodso's story here and how his recovery after emergency surgery was aided by eating ice cream.